A CASE element (or "selection") is a multi-way forking of the control flow within an algorithm. The branch to choose is determined by a comparison of the value of the control expression (discriminator) in the head with the branch labels (selectors). 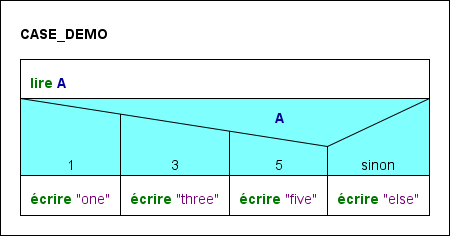 The number of branches is configurable (i.e. 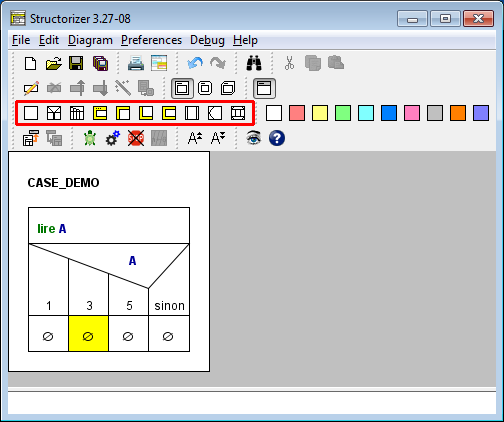 it depends on the number of selector lines you write into the text field, see below). Usually, a CASE structure provides a "ragpicker" branch (called default, else, or otherwise branch) placed right-most in order to catch any discriminator value not matching any explicit selector. In contrast to an IF statement, the controlling expression (discriminator) is not of Boolean type but typically yields an integral number or a character (in Structorizer it might also evaluate to a string). The selector values are then constants (literals) of that very data type to be checked against the actual value of the discriminator expression. In order to add a CASE element select the element it is to precede or to succeed. 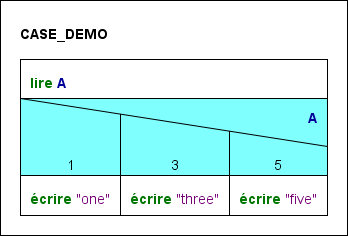 line n (the last line): the label for the "else" branch. (As outlined above, this is where the execution jumps into, when none of the selector constants from lines 2..(n-1) matches the discriminator result.) The label itself does not matter, unless you name it "%" - which would suppress the default branch. 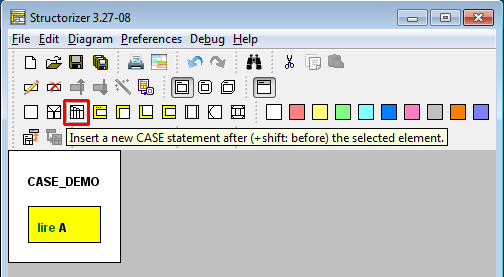 If you want to have a CASE statement without a default branch (= else part), simply write "%" into the last line. In that case, the last column will not be drawn. the respective branches, which are initially empty instructions (indicated by the ∅ symbols). In order to insert elements to a branch select the respective branch and insert the elements needed in the usual way (see Diagram/Add element). 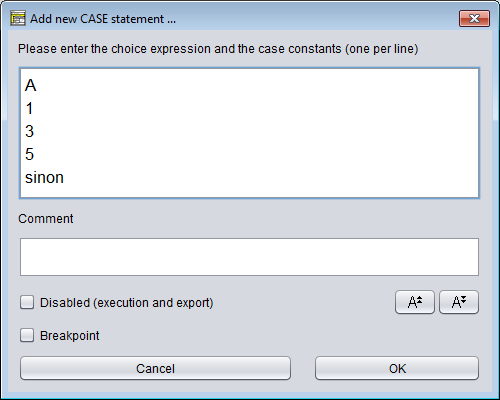 In order to append an element after the entire CASE statement select the head of the CASE structure first and then add the element to follow as usual (see Diagram/Add element). To pass a CASE element means to evaluate the discriminating expression and to execute the branch the selector of which matches the discriminator value. 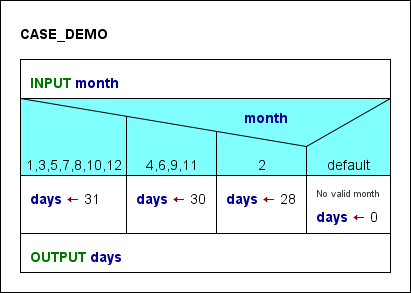 After the branch has been executed, the control flow passes to the next element appended below the entire CASE element - independent of the selected branch. So edit with care! If you want to avoid hassle then add new cases preferably near the end of the list (though the default case must always be the last one) and copy the contents of branches prone to vanish before you start to remove obsolete selector lines from the text. An option in Structure Preferences allows you to rotate atomic or collapsed branches in CASE elements with many branches in order to reduce width. 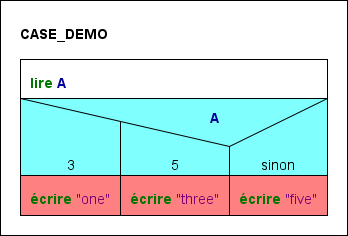 See an example in Structure Preferences.